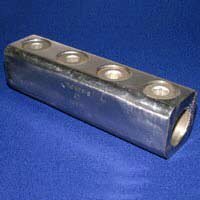 SR-Aluminum Splicers & Reducers | Cal Fasteners, Inc.
CMC® Splicer's/Reducers are manufactured from high strength 6061-T6 aluminum alloy. This insures both maximum strength and conductivity. They are dual rated for copper and aluminum conductors and are electro tin plated to provide protection against corrosion and provides low contact resistance. These have rounded corners which facilitate tapping and a solid center barrier which prevents different metals from coming into contact. For more information on Splicer's / Reducers, contact: Cal Fasteners to find out information more or contact us to Request a quote.